Thomas Nashe was a versatile Elizabethan writer who wrote plays, poems, pamphlets and prose – and was also known to write erotica for noblemen. He was about the closest any Elizabethan came to being a novelist and achieved fame with his story The Unfortunate Traveller, about the wild adventures of an adventurous young traveller, Jack Wilton. Literary critics regard it as one of the most important forerunners of the novel form. 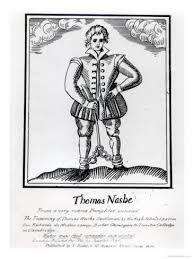 After leaving the University of Cambridge in 1588 Nashe went to London, where like many talented young writers who gathered there, he fell in with the playwrights who were providing plays for the London Theatres of Shakespeare’s era. He and Robert Greene became close friends and worked together. One of his greatest successes was the play, Dido, Queen of Carthage (1594) on which he collaborated with Christopher Marlowe. A collaboration with Ben Jonson ended badly when they were both prosecuted as a result of their satirical play, The Isle of Dogs, in 1597. Nashe then retired to Yarmouth where he lived in seclusion and died there in 1601, aged 34. He shared a patron with Shakespeare – the Earl of Southampton – to whom he dedicated The Unfortunate Traveller. In October 1592 he wrote a musical entertainment, Summer’s Last Will and Testament, one of the earliest masques. Shortly after the young William Shakespeare’s arrival in London Nashe helped him with Henry VI Part 1, where, although it was published in Shakespeare’s name, he wrote a large amount. Scholars now believe that he wrote most of it, Shakespeare contributing only a few scenes. In 1593 Nashe wrote a devotional work, Christ’s Tears Over Jerusalem but, as a satirist, unable to help himself, he included some satirical material, which incurred the displeasure of the authorities and he was sent to Newgate Prison for a short time. Imprisonment was an occupational hazard for Elizabethan writers. They had to tread carefully, and we see in Shakespeare’s career, for example, that he avoided setting plays in contemporary England, which allowed him to disguise the contemporary English political issues he was always addressing, by distancing them in time and location. It is widely accepted that Nashe was killed by one of his associates in the house of Elenor Bull. Much has been written about the band of brothers that he associated with and their suspected secret agent roles. An inquest was held and a record of it exists and has been the subject of several recent publications. Some have suggested that he and Marlowe faked their deaths and secretly wrote under other names. Nashe had been officially banned for making further publications so he had a motive. If he died in Yarmouth that’s news to me. My family are Nashe and we come from Norfolk not far from Thetford where Thomas grew up. My direct family are contemporaries although we claim no relationship with Thomas.